What does the budget mean to you? Traditionally, people tuned in to the budget announcement to hear whether the price of petrol was going up, whether drink and cigarette prices were being hiked, or whether any changes were being made to increase tax or to cut the dole. These years the budget looms over us like the end of the world and most households dread it. €25billion has been taken out in taxes and cuts since this crisis began and the government plans to take another €9billion, minimum, to reach the 3% Stability and Growth Pact target. This year’s budget alone will hit us with another €3.5billion in taxes and cuts. This is against a backdrop of continued payments to bank bondholders and the promissory notes (€64billion into the banks so far) and the refusal of the government to stimulate the economy and create jobs. The policy of this government, like the last, is to make ‘adjustments’ that impact the most on those who can take it the least. Taxing the lowest paid, squeezing families crippled with mortgage debt and rising bills, attacking the disability sector, decimating hospitals and schools, and tearing at the fabric of rural communities has become the norm at budget time. People don’t tune in to the budget now to see what the price of drink or petrol is going to be. They tune in to see if, after this budget, they’ll be able to feed and clothe their children, pay the ESB, keep their car on the road and keep a roof over their heads. Some will watch this budget wondering if their children will get home from England, Australia or Canada. They will wonder if this state will ever again offer a future to tempt them back for good. They will know that along with their children, 87,000 people emigrated last year and the same numbers are predicted to emigrate next year. People have been sorely let down by this new government. The Labour Party promised they’d protect the vulnerable at budget time, yet they continue to target children, the disabled and the elderly. Fine Gael promised an end to crony politics and a new era of openness, yet their health minister, who will preside over more health cuts in this budget, has become yet another symbol of a failing political system. Budgets are about choices. Do you introduce a property tax that will target already stressed families, or do you introduce a wealth tax that asks the richest to contribute more? Do you cut the state pension, or do you change the tax treatment of private pensions? Do you target child benefit, or do you reduce the salaries of politicians, CEOs and top civil servants? And fundamentally – do you concentrate on reducing a deficit with taxes and cuts, or do you look at the wider economy to see what the real problems are in employment numbers, in your banking sector, and in emigration figures? These are the choices that the government has before it. So far, Labour, Fine Gael and Fianna Fáil have shown themselves capable only of making the wrong choices, the cowardly choices. Sinn Féin believes the government’s role in the economy has to be about more than deficit reduction at the end of the year. We have consistently set out the need for investment in job creation and we just recently launched a €13billion stimulus plan and a range of other measures to save and create jobs. We have consistently argued for an end to the bail-out of banks and bondholders. And we’ve consistently set out growthfriendly, fair measures to make a deficit adjustment that adds up, but has the least harmful impact on families and services. We set out in our alternative budget how to meet the €3.5billion deficit adjustment that the government wants to make next year. We also set out new expenditure proposals that would improve people’s lives. 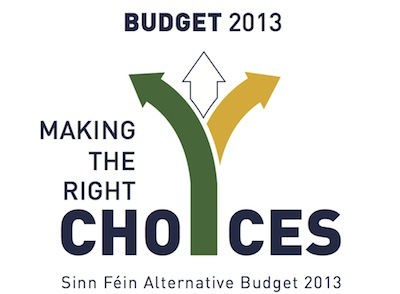 This Sinn Féin alternative budget is about more than just reaching a €3.5billion target. Ours is a budget that makes a difference – to the state’s finances and to people’s lives. Our budget is about making the right choices.